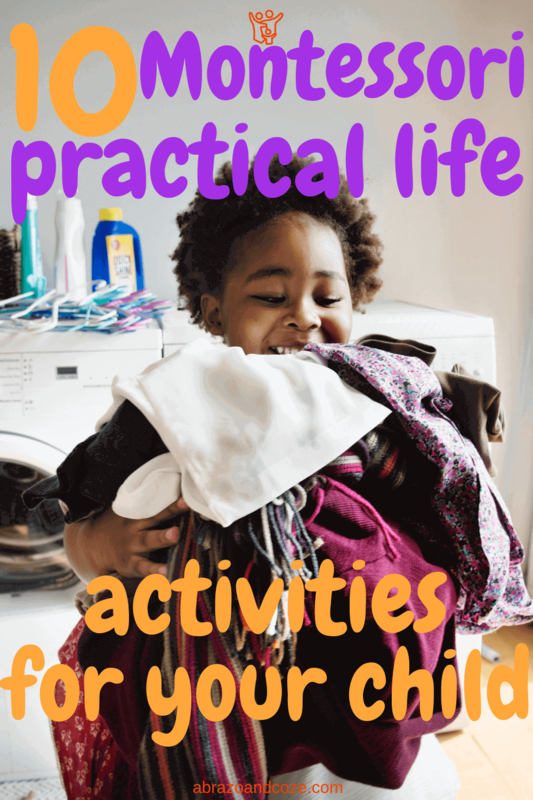 Practical life skills are so important for kids to learn. Things like household chores, food prep, cooking and baking, and outside chores are all essential skills. Unfortunately, it takes lots of time and patience to teach them these skills. There are several Montessori practical life activities that can assist in the task. Know your why. Why is it important to you that your children learn these skills? 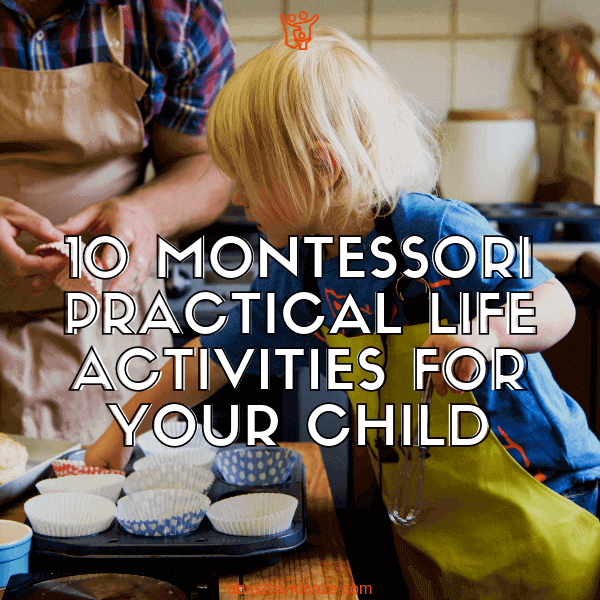 If you need to, write down why you want your children to participate in these Montessori practical life activities and post the note on your bedroom mirror to review as part of your morning routine. At night, as part of your evening routine, review your note and reflect on your successes in achieving your practical life skill lessons, and consider how you can learn from any challenges that cropped up. 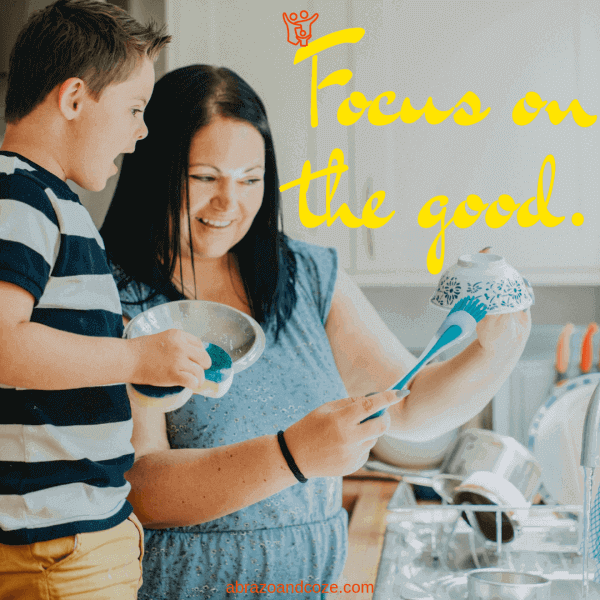 Instead of seeing your daily tasks as things that need to get done, try seeing them as teachable moments and opportunities to spend time with your child. 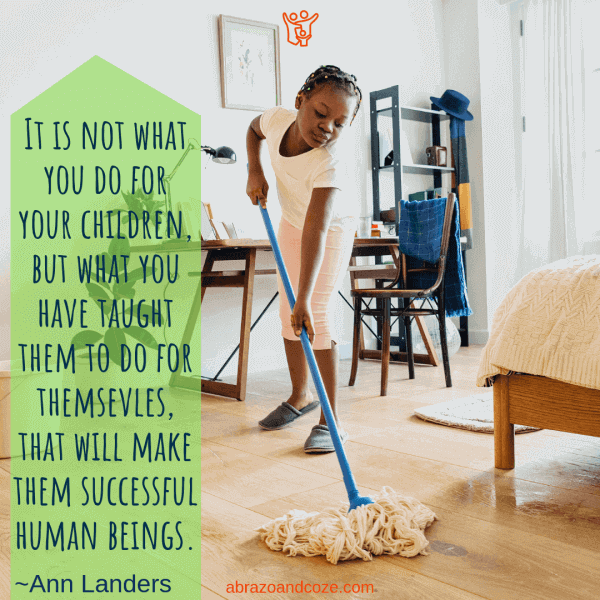 Instead of just doing everything after your children go to bed or demanding them to clean up after themselves, do it together and do it while having fun. How can you have fun while doing chores? Put on some music or engage in good conversation. If your child is old enough, ask some trivia or ‘would you rather’ questions. Ask them what their favourite things are. Try to find a new or different way of accomplishing the task, while keeping the mood light. Allow for mistakes and don’t over criticize. Your children are still learning, and it will take repetition and time for them to consistently do it up to your standards. Praise their efforts and thank them for the work they are doing. A positive work environment goes a long way to motivate a person to want to keep up that good work. Change your end goal of just getting everything done to guiding your child towards independence and growing your relationship with them. Once you do, notice how the attitude towards the task changes. Keep reminding yourself that one day when your child has their own home, they will thank you for taking the time to teach them these skills. 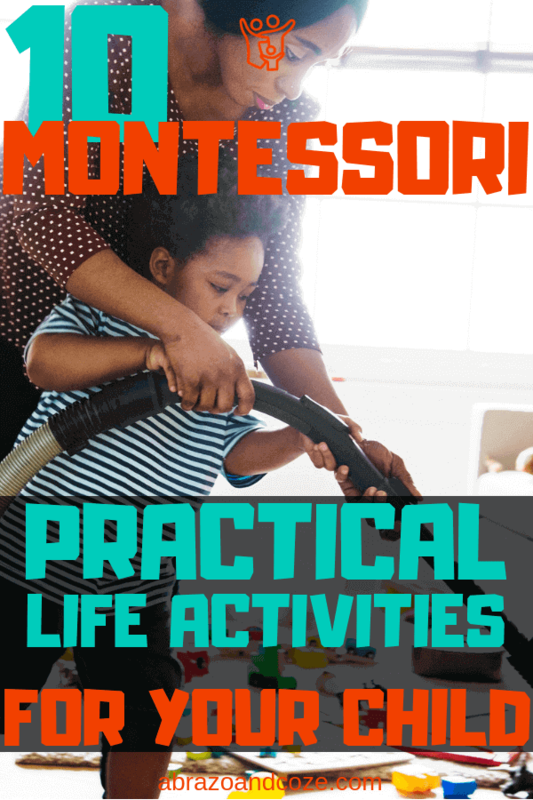 Of course, there are other Montessori practical life activities you could do with your children, these are just a few that my family does. You can adapt any of your daily life activities to fit the ages and developmental stages of your children. Life skills are life skills, after all – make them all fun and enjoyable to learn. I bought a small pitcher and get my children to pour themselves and others something to drink. As they get more proficient and their muscles get stronger and better coordinated, you can begin to increase the size of the pitcher. This is also a good time to teach manners. Practice role-playing and saying things like ‘Would you like some…’, ‘Yes, please’, ‘Thank you’, etc. I like buying food in bulk, so I get my kids to transfer the food from the larger bags to smaller containers. They use different sizes of spoons and funnels to keep things interesting. Not only is this an ideal Montessori practical life activity to learn how to transfer something from one place to another, but also refines small motor skills. It is teaching about texture (they will notice how the oil sticks to the sides of the funnel more than the vanilla extract, for instance). And it is even teaching them about money, especially if you have them along for the shopping trip working out the differences in prices. To extend the activity for older children, you could even have them assist you with meal planning for the family, and creating the shopping list to go with it. Check your local dollar store to find a small spray bottle. Fill it with water until they are old enough to use it correctly. Place it in a basket with a rag and get cleaning! Start with windows, then do walls, bathrooms, tables, shelves, or even floors! Make sure the basket it somewhere within reach so they can grab it whenever a mess is made. I will admit, some days this one is tricky for me. My children love to help, but they also love to sample and it drives me nuts! I try to have everything ready before we start and we only do it when the baby is napping. I also try to find simple recipes with the least amount of ingredients, but undoubtedly, chocolate chips are always involved! Children can measure ingredients. They can transfer pre-measured ingredients to the mixing bowl. And they can mix, too, of course. They can also transfer the batter to the cooking pans. Use your judgement on their strength and abilities before deciding whether they can help to put the baking pans into the hot oven or not. Safety is important, and part of learning to bake is learning safety precautions and concerns in the kitchen. My younger son is especially fond of this task and will regularly feed our fish without needing to be reminded. Ensure your children know where the food is kept, and any special additives required for the water. Have a scoop available for measuring and transferring the food to the pet’s dish (or to the fishbowl). Have a kid-sized watering can or small pitcher for watering plants. First, you’ll want to find a broom that is an appropriate size for your child. That way they can focus on the act of sweeping rather than on managing an awkwardly large adult-sized broom. I like asking my kids what they think will happen if we leave all the crumbs on the floor. Perhaps if they understand the implications, they’ll be more interested in sweeping up after their messes. Sometimes we also race to see who can get the most crumbs. A little competition is a great way to motivate children to happily assist with sweeping up (and other chores, too). This task includes everything from each child having their own little dirty laundry basket, to putting their clothes and soap in the machine, to hanging the clothes on the line outside, and putting their clothes in their dresser. What it doesn’t include (at least not yet!) is folding the clothes. My children show no interest in folding. Every child is different, and you might find that yours love folding (wouldn’t that be a dream!). You can try making it into a race to see who can fold the most clothes. Or instead, you could each have an equivalent amount to fold and then at the end of the day they could ask their other parent (or another adult) to guess which the adult folded. It might motivate them to do a good job folding if they have a chance at being a better folder than you. If you don’t call it a chore, they won’t know it’s supposed to be work. As you’re all shovelling put all the snow in a pile then play king/queen of the castle or make a fort. Have a snowball fight. If you have lots of snow to shovel, suggest piling it all in one spot, and once it’s big enough, use it as a small sledding hill. Making it fun means it’ll take the kids longer to get the shovelling done, however, it will get done without complaints. Once the fun is over, everyone can come inside, make hot drinks, and warm up together as a family. I can’t say for sure that my boys actually enjoy this one, but they do it after every meal without complaining. Sometimes they try to leave without loading the dishwasher and I gently ask ‘Did you forget something?’ They usually smile and get it done. I highly recommend doing some gardening with your child. Even if you don’t have a plot… Even if you’ve never grown anything in your life… Just search online for ‘apartment gardening’ or ‘small space gardening’ and get started. It’s important for your child to know where food comes from and that if they care for this planet, it will take care of them in return. 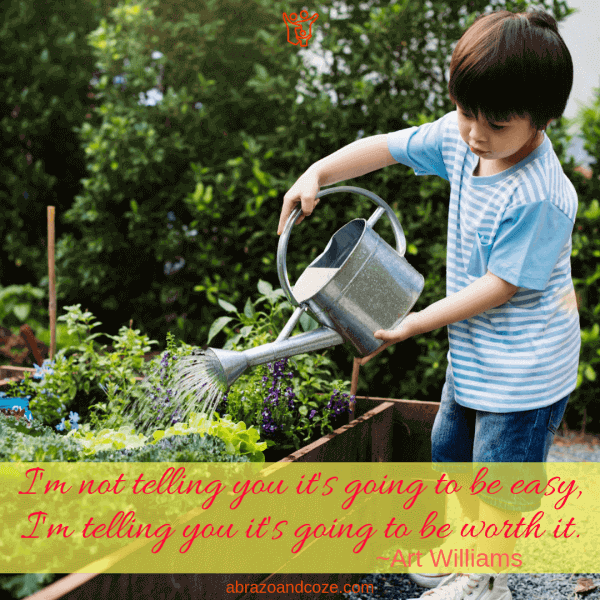 The best part of gardening with children is that they can be involved in every step of the process, from choosing what seeds to buy, planting, watering, weeding, and harvesting. If you want to learn gardening together with others, consider creating a local neighbourhood gardening children’s club. First, this task requires constant adult supervision. Second, what child wouldn’t love handling a dangerous tool?! Make sure the knife you let them use is age appropriate. You can find all sorts of different toddler knives that will make chopping food less stressful for you. Start with softer foods, like bananas, and eventually, you will never have to cut onions again! Take the time today to decide which tasks you will ask your child to join you in. For which tasks will you join your child? Even if they already know how to do an activity, don’t you think they would love to spend that time with you? 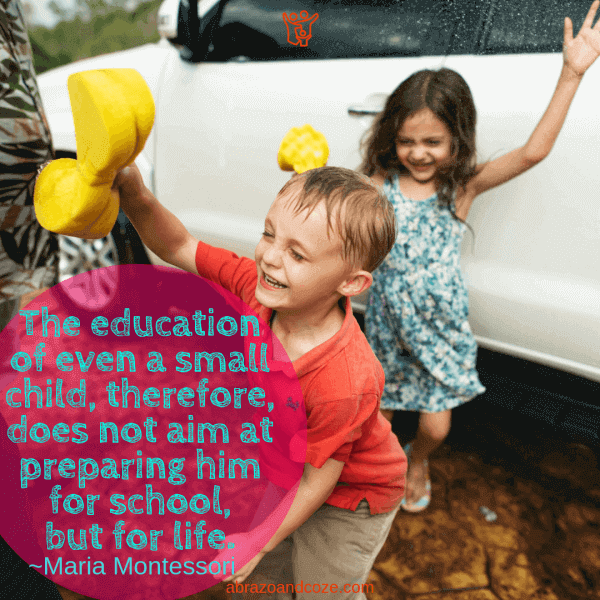 If your children haven’t ever assisted up until now, add in Montessori practical life activities slowly and start with the activities most likely to be enjoyable for them first. Gabrielle is a young mother of 3 kids. She loves Jesus, her husband, sushi, wine, travelling, and reading. She homeschools her children using the Montessori Method and hopes to inspire parents like you to navigate the method at home through her blog Plenty of Trays. There you can find easy and affordable Montessori DIYs and free French and English printables. This is amazing! I firmly believe that parents should decide the kind of tasks they want their child or children to learn. I agree. And it’s so much easier if you start when they’re younger. One summer with my eldest, when she was 5 or 6, we grew a “rainbow garden” after reading a book with a title something along those lines. We had all the usual garden vegetables, but in unusual colours (purple potatoes, green striped tomatoes, bullseye and yellow beets). I hope my youngest two enjoy gardening as much as she did. It’s good to train children from their childhood with positive thoughts and works. It will make them active and add more values to their life. Thanks for sharing. Such great activity ideas and they are so easy to do my chores will be done too and kids will stay busy too. Getting the kids involved definitely will (eventually) cut down on the workload of whomever normally does those chores. It’s good to have busy kids, too. Great ideas here – Baking and Gardening are my personal preferences! Thanks for Sharing! My 4 year old has no interest in our garden, but my two year old likes to “help” (she was 1.5 last summer… it wasn’t really “help”). Eventually she’ll understand weeds vs plants. And the patience of seeing them making a mistake is the most challenging one for us parents. It is very challenging to find the patience to see our kids make mistakes, that is so very true! This is great, children should learn from a young age, as soon as they can, and still if you make it fun they will gladly do it, and help you with the chores, especially with shoveling snow, like you make a giant pile and then you have a snowball fight, these tips will be usable in the future for every parent. Oh, I love this! I ran a Montessori School for 15 years (elementary and middle school) but my kids started at age 2. It’s magic and I attribute their creativity and independence to their Montessori years. Wow! That’s amazing. You have helped so many children become great, independent adults! Thank you! I’m excited to try these with my son when he grows bigger. These are great tips. I really like the transferring idea. This would be easy for little hands. That’s awesome. The guide has many things which are really awesome for many parents. Many things are mentioned which are useful as life skills, and it’s important for kids to learn them. Yes! Kids need to learn how to do these things. The sooner we include them the better! When I was a homeroom teacher for nursery class, I taught pouring water into cups. I was amazed at how excited the kids were to do it, and they all did such a great job. I thought for sure they would be bored and make a mess! I love how kids completely surprise adults. Generally speaking, I think a lot of us underestimate their abilities (at least for some things). Right?! My kids are always surprising me too! Great ideas. It’s totally timely. I would try those to my daughter. Thank you so much. I’m glad you like them! It’s so fun when we (adults) take the time to slow down and include our kids in everyday tasks. I’m sure she will love spending the time with you! Such great ideas! I don’t have children of my own yet but I will definitely keep these tips in mind. I’ll even practice on my nieces and nephews. Thanks for sharing! I hope to be like this when I am a parent! I know it’s easier said than done but I want to give my child the chance to learn through every activity – shoveling snow, chopping food, etc. I think the hardest part about teaching practical life skills is actually letting yourself be okay with the extra time it takes for kids to do the tasks, and to guide them to do the tasks properly without getting frustrated (at least, that’s my issue… I do my best, but I’ve cleaned up after all of my kids, including the 22 year old on occasion). I figure as long as they get to do it sometimes, and I make it a pleasant experience on those occasions, they’ll be more likely to want to do it again. With one kiddo out the door, I know the approach works because she’s self-sufficient and capable. But I sure wish I’d had a post like this as a guide when she was small. I agree with you Anna! I need to make an effort and am constantly reminding myself of the end goal (independence) when I’m doing these things with my kids!